Do you know what this building is or where it is located? Covering History: Revisiting Federal Art in Cleveland, 1933-43, a beautiful, 72 page joint publication of the Cleveland Artists Foundation and the Cleveland Public Library. It picks up where Karal Ann Marling's work (Federal Art in Cleveland) left off, and is highly recommended. 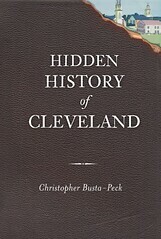 Any of the other publications of the Cleveland Artists Foundation that are still in print. The CAF is the organization publishing works on the history of art in greater Cleveland. All guesses must be made as comments on this post. If the answer has not been correctly guessed by 2pm, the post will be edited to include a clue. If it has still not been guessed by 8pm, it will be edited again to include another clue. Brown Hoist Machine Co., Hamilton St.
Wow. Bill Rupnik got it! I thought that by picking someting important but off the beaten path that it would be a bit more of a challenge. The Brown-Hoist Building is on Hamilton Street, between East 40th and East 45th Streets. 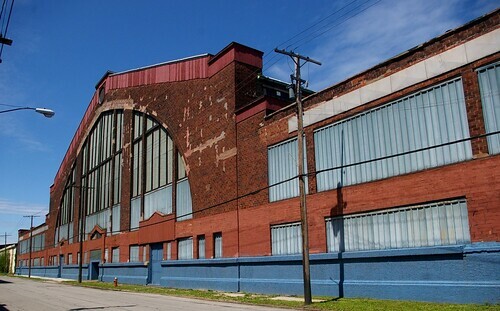 The massive machine shop was designed in 1901. The architect was J. Milton Dyer, who was also responsible for such notable buildings as The Tavern Club, First Methodist Church, the Peerless Factory, and the Coast Guard Station. Eric Johannesen called it a "landmark building in both structure and architecture. It was the first building erected employing a new fireproof method invented by the owner. It is also an unusually expressive example of industrial architecture." I know that area very well. Brown-Hoist is a magnificent structure. what did the Brown Hoist Machine Co. do?